come to find out since the incident -- has bitten a bushman or two, kicked a volunteer or two, and is generally a problematic animal. 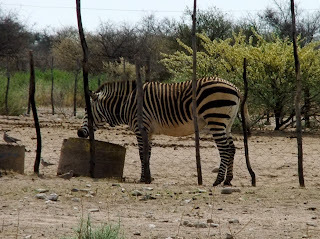 Before I could put the oil drum back on the trailer or even drop it, the zebra reached over the short wire fence and bit into my lower back. The pain was intense. I screamed probably unlike I’ve ever screamed before since the pain was unlike any I’ve felt before. I could see my escape route, but I needed him to let go in order for me to get to it: under the trailer was where I was going. For about 30 seconds this zebra was biting and sucking. Because of his position I couldn’t hit him, but a couple of the bushmen ran over and tried to get him off of me. I had fallen to the ground, closer to my escape route but was still attached to the animal. Finally, the hold was gone, and I pulled myself through the dirt under the trailer to the other side, where Jule, Mette, and Katrin were in various stages of shock but ready to attend to me. Marnus eventually rode up on a quad bike, but I couldn’t be taken back on the ATV. The pick-up truck was on its way to get the Brothers or the Babies and accompanying volunteers when it was diverted to come get me to go back to the farm. En route, the truck rolled with Rebecca and Megan inside. Someone else was now on his way on a tractor with a trailer to bring us back to the farm. Finally the tractor comes lumbering along. We made our way along bumpy sandy paths in the trailer, with me laying my head on Katrin’s lap trying not to think about what my back might look like and certainly trying to keep my mind off the pain. I’m fairly certain the bruises I had for a while on my left hip were a result of bumping along in the trailer. Oh well. At this point, Marnus had already said he’d never seen anything like the wound on my back. He fortunately also added that the zebra did not puncture my skin. Nevertheless, the next several people also said they’d never seen anything like this before. Right. It’s a good thing I a) couldn’t see what my back looked like and b) was too busy not focusing on the pain to really think about what that meant: “ I’ve never seen ANYTHING like that before!” It would seem that my skin had been balled up and twisted. There was a lot of discoloration and swelling. I have yet to see pictures that were taken right after. This is the point where my nurse shift happened. I went to lie down on a mattress and had my nurse Barbara looking after me. Cheri, I believe, went to get my backpack or just my iPod shuffle (i.e., "mix tape") that had been given to me as a gift before leaving on this adventure. That’s really all I wanted then. Barbara tried in vain to not make me laugh while pointing out wildlife in a book but kept me company. An hour or so later, Becca, Megan, and I were transported to Gobabis to see a doctor. Without dragging this tale on any longer, I ended up getting a type of second-skin bandage called Tegaderm (by 3M) which I change every few days. Everything seems to be healing, although I have no idea what the end result of that healing process will look like. The majority of the week following that saw me helping out with various IT issues and projects in the office rather than spending much time doing farm work or walking lions or cheetahs, etc. 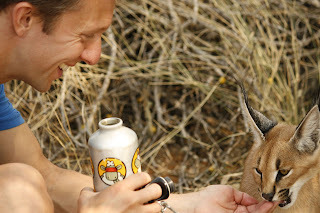 Although it was nice to feel like I was contributing on some level to the programs at Harnas in the first days of recuperation, it was certainly frustrating to be in a building in front of a computer rather than out in the bushveld with the animals. ... I'll clos e the blog chapter on Harnas by simply saying that, despite the above incident and the ramifications I'm still very aware of, I wrapped up my stay with such positive feelings about this place, in particular for a caracal named Tammy and a 1/2 African wildcat named Malcolm who curled up next to my head in my sleeping bag one night. Those two kitties were the last animals I said goodbye to the day I left Harnas. If only I could have taken both of them with me as I traveled on. I think cutting up bits of meat for them everyday could get expensive though.